Hello Simply Stacie friends! It’s Nicky here from Kitchen Sanctuary. 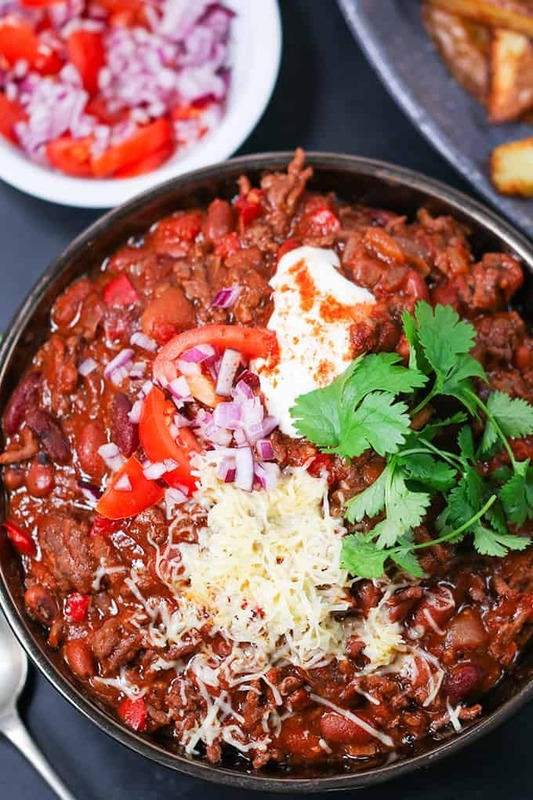 Today I’m bringing you a recipe for a quick beef chili. Served over oven-baked potato wedges it makes a lovely comforting winter dinner. 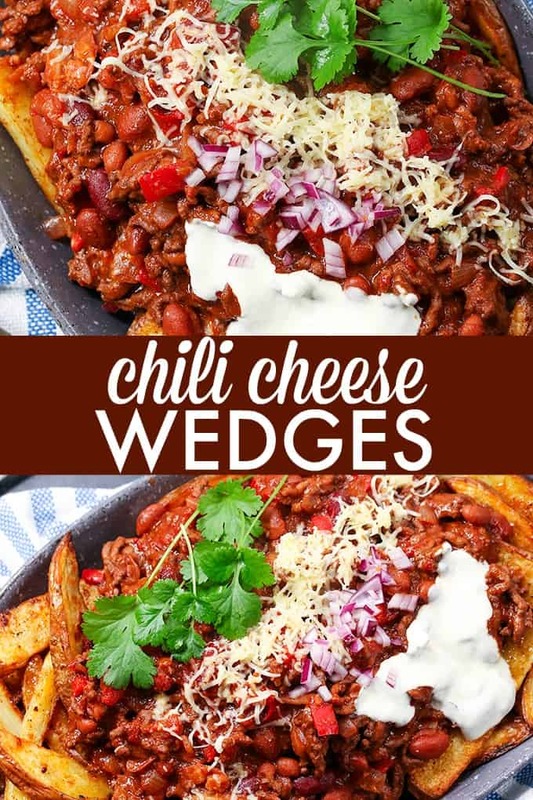 I’ve based this recipe off my husband’s classic chili recipe. Just a few minor tweaks here and there to make it quicker and simpler. Usually I do most of the cooking, but Chris insists the BBQs and Chili are his domain. He does do a particularly good job of both, so I guess I can’t complain! Come to think of it, I don’t think I’ve cooked a single thing on the barbeque in the 12 years we’ve been together! This recipe should serve 5-6 people (or 4-5 very hungry people! ), but you can stretch it out a little further with the addition of some extra bell peppers and/or beans. 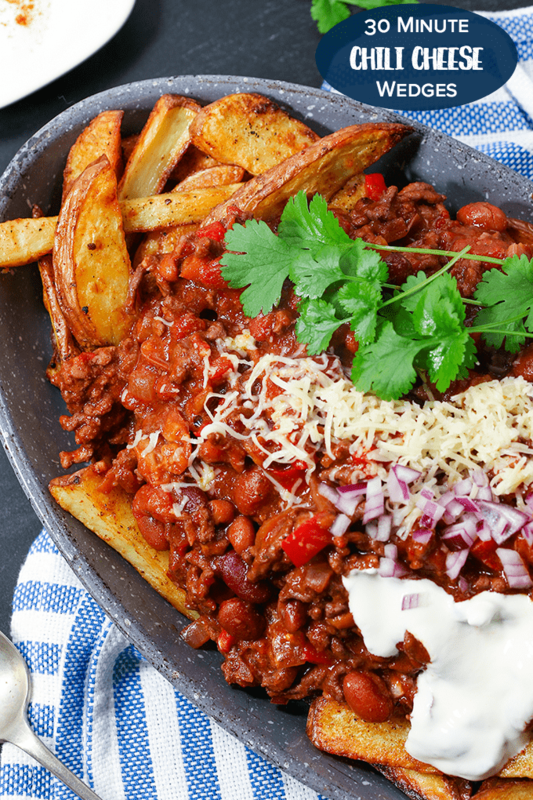 If you have any leftover chili, it can be cooled, covered and refrigerated or frozen for an even quicker meal later. 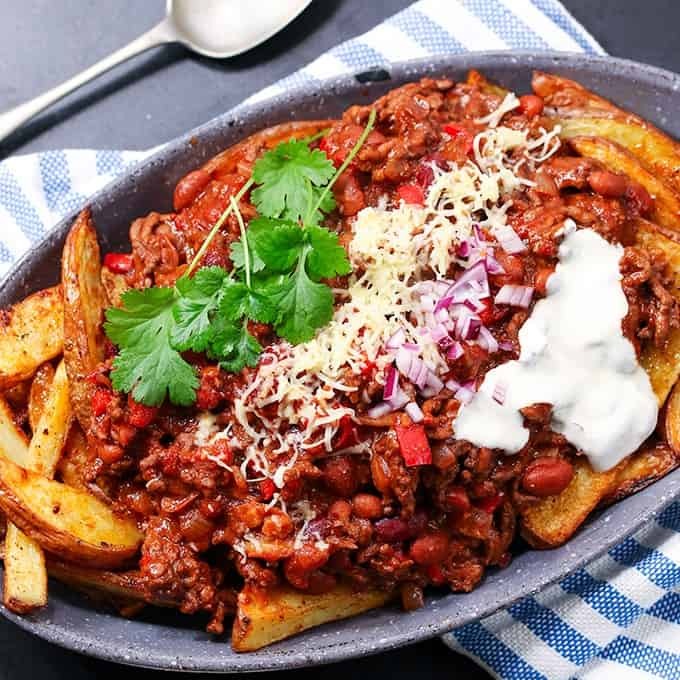 Are you a fan of chili on fries? 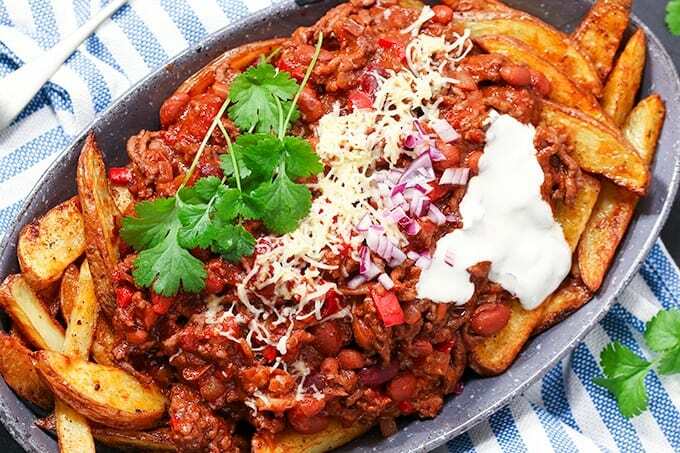 Homemade beef chili served oven-baked potato wedges makes for a mouthwatering winter dinner. 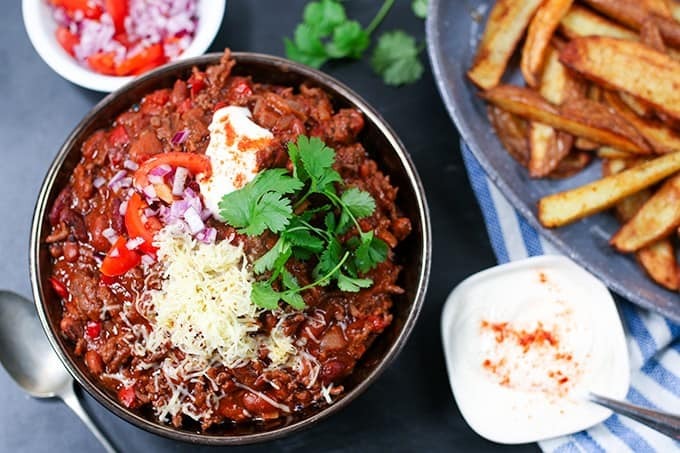 If you like comfort food, this recipe is for you! Slice the potatoes into wedges (don’t remove the skin) and place on a large baking tray. Drizzle on 2 tbsp of olive oil, ½ tsp of the cumin, ½ tsp of the paprika and a good pinch of salt and pepper. Toss everything together using your hands and place in the oven for 20-25 minutes (turning twice during this time) until golden brown. Whilst the wedges are cooking, heat the olive oil in a large skillet. Add in the onion and cook on a low-to-medium heat for 5-6 minutes – until the onion softens. Add in the garlic and ground beef, turn the heat up to high and fry – stirring regularly to break up the beef – until the beef is no longer pink. Add in the red wine and allow to bubble until almost completed evaporated (about 3-4 minutes). Add in the peppers and cook for 2-3 minutes, then add in the tomato puree, sugar, chili powder, the remaining cumin, ground cilantro, oregano, the remaining paprika, stock cube and a good pinch of salt and pepper. Stir everything together, then add in the canned tomatoes. Half fill the tomato can with water and swill it around to catch any tomato juice left in the can then pour this in too. Add the mixed beans, bring to the boil and simmer for 8-10 minutes or until slightly thickened. Take the potato wedges out of the oven and place on a large serving dish. Spoon over the chili. Serve with sour cream, fresh cilantro, extra cheese and the chopped red onion and tomatoes.